Readers will be inspired, amazed, and amused by these stories of faith — the 101 best stories from Chicken Soup for the Soul’s library on faith, hope, miracles, and devotion. 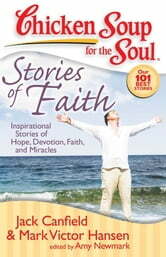 Filled with heartfelt true stories written by regular people, Chicken Soup for the Soul: Stories of Faith will amaze, inspire, and amuse readers. Its stories of prayers answered miraculously, amazing coincidences, rediscovered faith, and the serenity that comes from believing in a greater power will touch and resonate with Christians and other faiths.